In the south-west of the Delta, the scenically splendid Abu Concession varies from seasonally inundated floodplains, channels and palm islands in the north-east to the dryer Kalahari ‘Sandveld Tongue’ in the west. Here trees like Kalahari appleleaf and silver terminalia dominate, adding much contrast to this unique area. Big game is plentiful and includes frequent sightings of giraffe, buffalo, elephant, red lechwe, blue wildebeest, tsessebe, impala, zebra, hippo and warthog. Dominant carnivores include lion and spotted hyaena with occasional leopard and wild dog. For bird enthusiasts, some 380 different species can be found. Abu Camp provides guests with the extraordinary privilege of interacting with African elephants, of being part of an elephant herd, meeting each individual and beginning to understand what makes the largest land mammal tick. This is possibly the ultimate elephant educational safari. 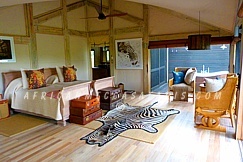 Set in age-old riverine forest, Abu Camp consists of six en-suite tents. 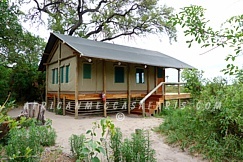 Seba Camp, set in an ancient riverine forest, offers secluded accommodation overlooking a perennial lagoon. 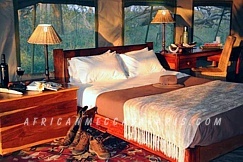 It has five well-appointed and spacious elevated tents, each with en-suite bathroom and private deck. Seba is family friendly, complete with family villa with two inter-leading en-suite bedrooms, a built-in ‘tree-house’ and a kids’ swimming pool.